This Kielbasa & Pierogi Snack Dinner is a foolproof way to get the family gathered around the dinner table on a weeknight. There’s something for everybody on this colorful platter! Earlier this year, I subscribed to a whole boatload of food magazines for food styling and photography inspiration. 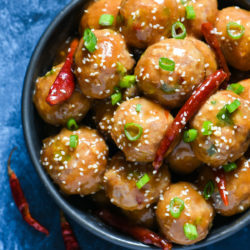 One of the healthy-eating magazines recently published an issue with a big platter of snacks on the cover, and declared snack dinners the “new” way to serve dinner. Dude, I majored in snack dinners in college. If there was an episode of “Beat Bobby Flay” that was Battle: Snack Dinner, I would beat Bobby Flay. 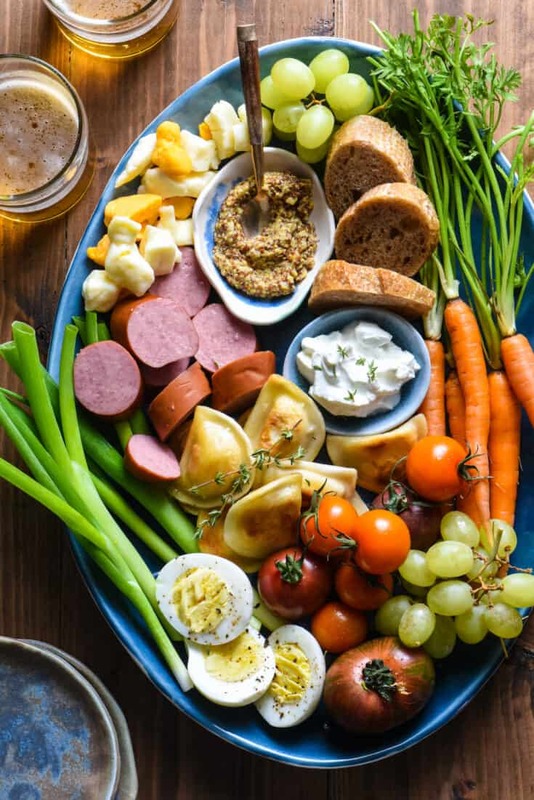 If you want to get in on the snack dinner “trend” that is apparently happening now / has always been cool / will never go out of style, this Kielbasa & Pierogi Snack Dinner is something you need to try as an easy weeknight dinner this fall. My snack dinners change seasonally, depending on what looks good at the market. Think of this one as a late summer snack dinner that’s a little cozier, a little heartier. It’s like a snack dinner wearing a puffy vest and boots. You know, the full Han Solo look. 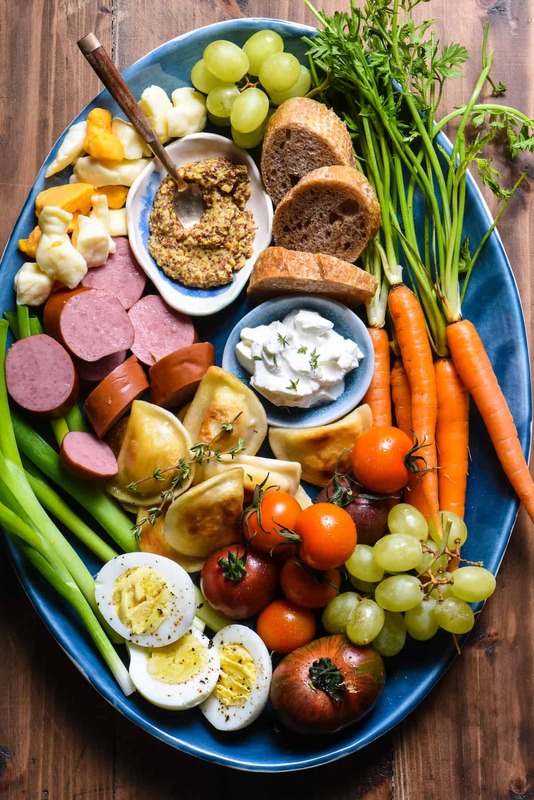 I’ll list all of the ingredients to make your best snack dinner ever in the recipe card below, but let me just give a special shoutout to JENNIE-O® Fully Cooked Hardwood Smoked Turkey Kielbasa. As a Jennie-O ambassador, I probably shouldn’t play favorites with their products, but psst – this is my favorite Jennie-O product. It comes fully cooked, so all you need to do is slice it up and add it to pasta, pizza, soup, etc. Or just add it directly to your snack dinner. 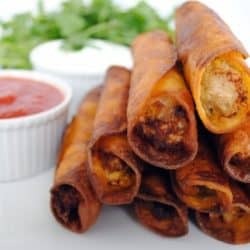 It has 65% less fat than smoked pork and beef kielbasa, but honestly, it tastes so great that I don’t miss that fat at all. This kielbasa is an absolute STAPLE on my grocery list! 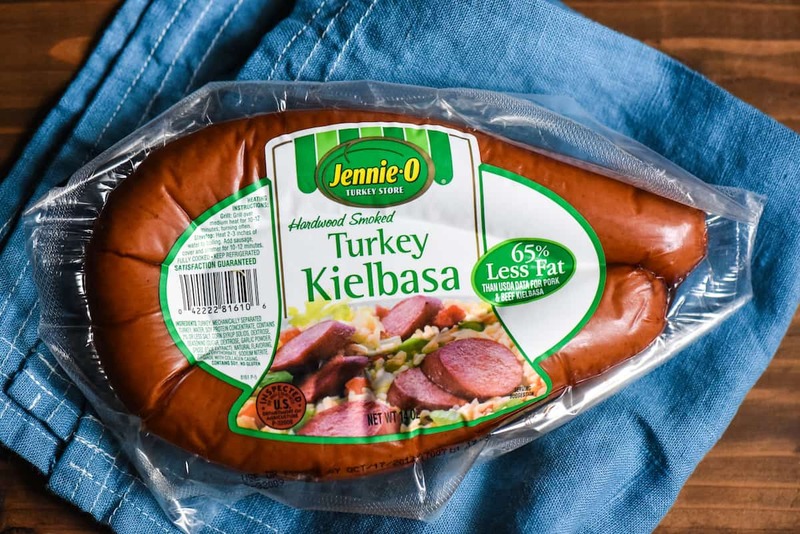 JENNIE-O® Hardwood Smoked Turkey Kielbasa comes fully cooked so prep time is minimal whether you’re cooking on a grill, in the microwave or simmering in a pot of water. For more information, be sure to connect with JENNIE-O® Turkey on Facebook, Twitter, Instagram and Pinterest. This Kielbasa & Pierogi Snack Dinner is a foolproof way to get the family gathered around the dinner table on a weeknight. There's something for everybody on this colorful platter! Prepare pieorgies according to package directions. If desired, warm kielbasa by adding kielbasa and a small amount of olive oil to large nonstick skillet. Cook over medium heat 4 to 6 minutes or until kielbasa is lightly browned, turning occasionally. Or, serve kielbasa cold, because it is fully cooked and ready-to-eat. 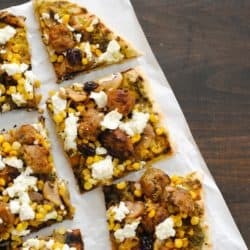 Arrange all ingredients on large board or platter; serve immediately. As much as I loved eating this snack dinner … The true beauty of this post lines in the writing. LOLed at the Beat Bobby Flay reference. And I may have shed a happy tear for the Han Solo look. In all seriousness, you have been the mayor of snack dinner town for years. They are always good. The peirogies and sausage were a natural pairing and the other items elevated the whole thing. Very Eastern European of you. Dude, I would TOTALLY beat Bobby Flay. Just saying.